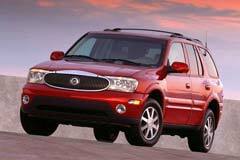 In 2004, Buick began the production of the Rainier line. Just 3 years later, the line was discontinued and the only way to get one after 2007 was to find dealers that have used Buick Rainer models for sale. The line was replaced by other models after it was discontinued. During its production years, the model did not receive any kind of updates to the engine or design. It was available with a 4.2 liter V6 or a 5.3 liter V8 with a four speed automatic transmission and rear-wheel or four-wheel drive. The model was one of the first to feature Quiet Tuning sound insulation. From the outside, the design of the SUV resembled the Oldsmobile Bravada but with a new front fascia that is specific to Buick models. It featured an oval front grille with headlights arched to fit on the sides and a large prominent bumper. The interior is spacious, featuring all leather seats and moveable back seats for additional storage volume.